Avengers: Infinity War changes everything…maybe. Ten years and 18 films of world-building – the best of which, like this year’s Black Panther, focused more on characters than broader connectivity – have led to this grand crossover culmination that poses like an audacious turning of the page in the MCU. 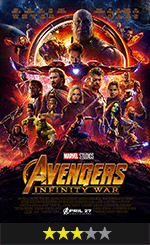 It’s a little tough to buy the boldness, however, considering there’s another Avengers coming out 13 months from now (shot at the same time as this one) that could easily undo many of the shocks of Infinity War. This could, it seems, go on forever.